Have you ever shopped on a website you just loved everything about? That’s how I feel about Kringle Candle Co. I love the layout of their website and could spend hours browsing all their pages. The site is all white with an elegant feel to it but I think it’s the pictures that do it for me… they are large, crisp and super detailed. When I hit the Apple Cider Donut page and saw the label, I was sold. But it was the first time I smelled it that had my mouth watering. Kringle sent a little sample of it with an order I placed and oh my goodness, I almost died when I smelled it – and of course I kicked myself that I hadn’t purchased it with their prior sale. It was so sweet, warm and beyond delicious – and most of all – very realistic. To me, that’s a true testament of authentic bakery scents… when it’s hard telling the candle apart from the real deal. Our Apple Cider Donut is infused with spice-sweet cider notes and a lavish dusting of sweet cinnamon. Best of all, this guilty pleasure is 100% calorie-free! Yeah, calorie free until you burn the candle, crave donuts and then go buy some and eat the whole box!! Bakery scents tend to do that to you. But boy do they fulfill something in me when I’m craving something sweet. If I can’t eat it, I may as well smell it. First impression of this candle? The wax smelled delicious but light. It smelled like a doughy and flakey pastry with subtle hints of apple and cinnamon. Super yummy!! I decided to light this candle in a smaller room to start out because I wanted the maximum scent throw possible and boy was it a good call. Within 10 minutes of lighting the candle, warm cider donuts saturated the room and it was beyond delicious. It also smelled exactly as I hoped it would…. A warm and gooey pastry donut with hints of apple and cinnamon. Very warm and scrumptious!! Strength – on a scale of 1 to 10 – in a small room, I’d rate this candle an 8. In a medium room, a 6 to 7. I wouldn’t try it in a large room and if I did, I would burn two candles at once, not one. This candle gave a nice and steady medium throw in a small room and I thought it was perfect. My candle burned perfect. Zero issues. Clean burning with no wasted wax from start to finish. I thoroughly enjoyed this candle and highly recommend it to all bakery lovers out there. It’s not your average donut scent… it’s so much more. Keep in mind this candle did give a more subtle scent throw so if you try it, I’d stick to a small room or burn two candles in a larger room. I do that a lot and it works pretty well. Love Kringle Candles and can’t wait to try more. So yeah…more reviews are definitely coming soon. 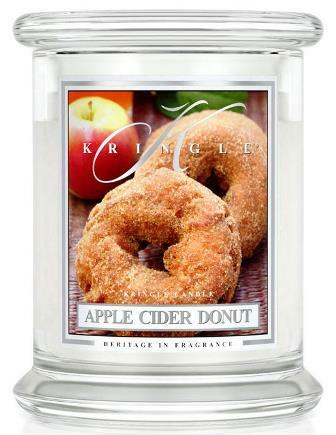 Have you tried Apple Cider Donut from Kringle Candle Co? Review it with us. In the comment section below, review and star rate your experience… it’s easy! 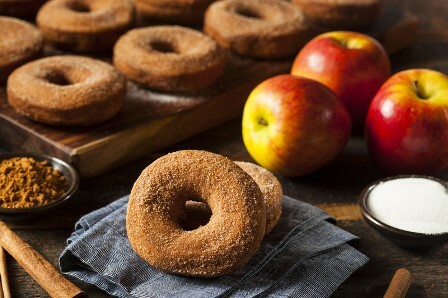 Scent description for Apple Cider Donut - Our Apple Cider Donut is infused with spice-sweet cider notes and a lavish dusting of sweet cinnamon. Best of all, this guilty pleasure is 100% calorie-free.